The original intention of the 5.45x39 round was a full metal jacket cartridge capable of penetrating light body armor as well as thin barriers. To do so the Soviet round has a full metal jacket (FMJ) over an internal steel core with a lead inlay. The cavity of the round is hollow, but designed not to deform or expand on impact with soft tissue. The 5.45x39 ammo is capable of reaching velocities of 2,900 feet per second. This blistering, but lightweight cartridge allows for a massive amount of penetration against soft flesh. 5.45x39 FMJ ammunition is generally pretty cheap, making excellent practice ammo. The rounds are lightweight, with a standard projectile weight of 53 grains, which makes them quite light and easy to carry in bulk as well. The 5.45x39mm FMJ round is small and lightweight, but was a feared cartridge in the Afghan-Soviet war, and was often known as the poison bullet. Probably nearing 1000 rounds of this through my Arsenal SGL31. No failures of any kind, accuracy is minute of soda can at 100 yards, haven't shot much off the bench to get more technical than that. 5.45 is cheap and this is among the cheapest, but it's performance is beyond its price. Shot 300+ rounds through my Arsenal AK-74. Have not had a single problem and accuracy is what I would expect for an AK. This is an OUTSTANDING ammo for the Saiga AK 74. This is the BEST performer that I have found and it is difficult ammunition to find. It's the only ammo that lets my AK 74 fire trouble free with various AK 74 clips. I've had problems with other types of ammo in my AK 74, but this ammo is absolutely fantastic. No jams at all! 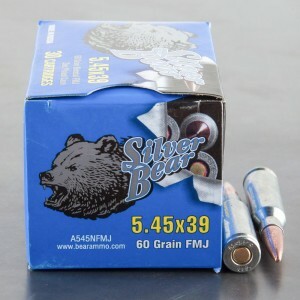 You can't beat Silver Bear 60 gr. 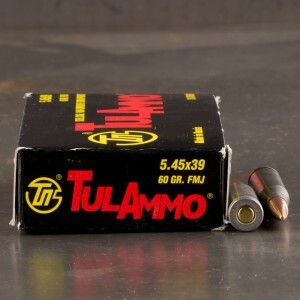 FMJ 5.45x39 and the prices/service at Ammunition to go can't be surpassed! Thanks, Ammunition to go!